Eismont et al. identified the risk of secondary cord injury in distraction flexion (DF) injuries management in 1991.' 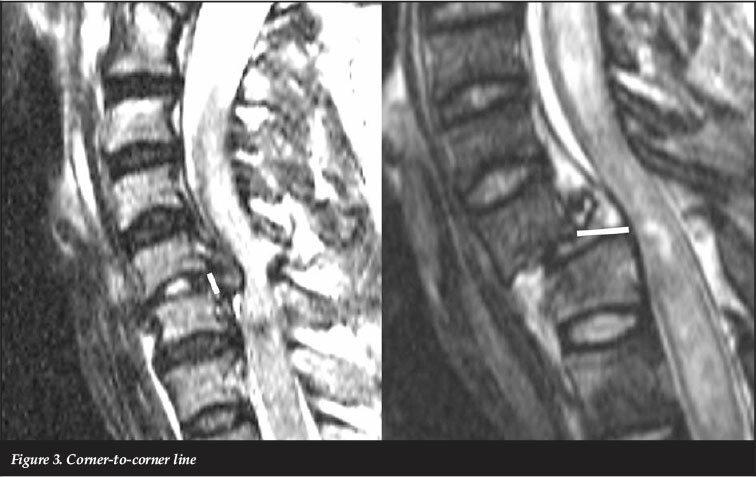 Pre-reduction MRI has been proposed to identify disc injuries that may compress the cord following spinal reduction causing a secondary cord injury. The necessity for pre-reduction MRI has been disputed by some due to accessibility issues and resultant delays. Hart and Vaccaro2 debate the issue whether MRI will identify patients requiring open discectomy prior to reduction as opposed to the view that the clinical risk of awake closed reduction is too small to justify MRI-related delays to closed reduction and thus indirect decompression. In many countries, MRI access is limited due to distance and cost. Although the use of sensitive MRI scanning may detect disc pathology, its clinical correlation has been called into question.3 Vaccaro et al. assessed the timing and influence of MRI on management of DF injuries.4 They found inconsistency between surgeons with regard to their use of MRI, as well as treatment modalities between the groups. Orthopaedic surgeons were found to be much more likely to perform closed reduction having reviewed an MRI. In addition to inconsistent MRI use, there is frequently a difference of opinion between clinical and radiological staff as to the status of the disc, thus making clinical decisions difficult. The aim of this study was to compare the interpretation of pre-reduction MRIs of DF injuries between radiologists and orthopaedic surgeons, and to determine consensus regarding the 'dangerous' disc. 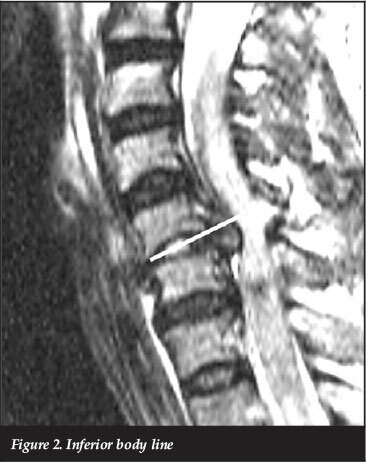 A 'dangerous' disc was defined as an uncontained disc, herniating posteriorly, that may be drawn into the spinal canal during closed reduction. Following approval by the Institutional Ethic committee (091/2011), 110 consecutive DF injury cases were identified over a ten-year period from the senior author's database. MRI scans (DICOM data) were collated from the hospital archive. The scans included sagittal and axial images in T1, T2 weighted sequences and sagittal STIR sequences. These scans were independently reviewed by a radiology and an orthopaedic team. The radiology team comprised an MRI-trained senior radiology registrar and head consultant of radiology and the other, a senior orthopaedic registrar and senior spinal orthopaedic surgeon. A meeting was held prior to the start of the scan review, where consensus was achieved on the variables to assess and the definition thereof as below. These two teams were blinded to the clinical scenarios and worked independently. The data obtained from each team was independently accrued and entered into Epidata statistical software. A double entry system was employed to reduce entry error.5 All data was categorical except disc heights. 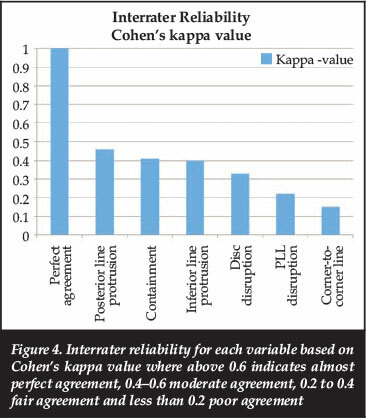 Interrater reliability/agreement was determined using the Cohen's kappa value. This statistical measure is used when comparing two researchers' observations. It is a measure used to determine the agreement while excluding the predicted agreement due to chance.6 Values of 0.6 to 1 show almost perfect agreement. Values of 0.4-0.6 are considered moderate agreement; 0.2-0.4 describes fair agreement; less than 0.2 indicates poor agreement. 1. The posterior longitudinal ligament (PLL) was assessed as disrupted, intact or unsure. 2. 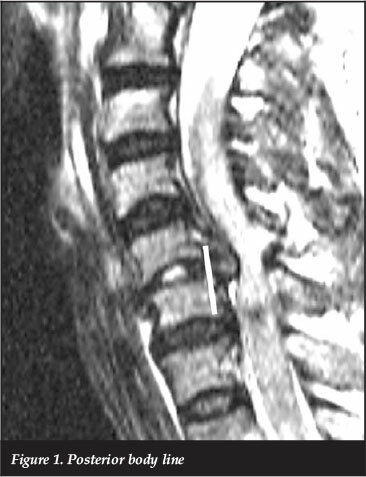 Disc heights were measured in millimetres at the midpoint on mid-sagittal view. 3. Disc disruption was measured by the presence of an intervertebral disc signal on T2-weighted images. Disc containment. This was a subjective assessment as to whether after assessing all the MRI sequences, the reviewer thought the disc was contained by the annulus or not. Figure 4 summarises the degree of agreement for each variable. The interrater agreement was never excellent as determined by Cohen's kappa values. There was moderate agreement on the posterior line, inferior line and containment assessment, with fair agreement on the rest. The manner of disagreement was however consistent. Radiologists reported a more severe degree of injury and were more often unsure of the appearance of the disc than the orthopaedic team. Table I highlights this pattern with reference to the PLL data. The large numbers in blue blocks represent the agreed assessment between the radiologists and orthopaedic surgeons, whereas the white blocks represent the disagreements. The rows represent the orthopaedic assessment and the columns the radiologists. Thus, in row one, the orthopaedic assessment was 33 'intact' cases. The radiologist agreed in only four cases, calling 20 of these disrupted and nine unsure. The numbers indicating disagreement are larger to the right superior area of the matrix. This trend persisted with all variables tested. The weight of disagreement may be interpreted as radiologists assessing an injury to be more severe than the orthopaedic team when disagreement was present. The requirement of pre-reduction MRI in DF injuries has developed since early case reports of secondary spine injury inflicted during closed reduction by uncontained cervical discs. Literature highlights these isolated case reports as preventable by identifying uncontained/ prolapsed discs with MRI prior to reduction. The reported incidence of potentially 'dangerous' disc lesions in DF injuries is high, ranging from 15-77%7-10 with a markedly increased incidence in locked bifacet injuries.9 In our study, the agreed incidence of uncontained disc lesions was 63%. Until recently this rationale made good clinical sense and was supported in animal studies;1213 however, recent evidence indicates the clinical benefits from reduction within 24 hours.11 It is with this in mind that early reduction should be prioritised above the possible (but rare) risk of secondary cord injury during reduction and subsequent disc migration and cord compression, provided the patient is alert and able to communicate during closed reduction. Although MRI scanning has been employed in this context for many years, there have been no clear guidelines to which disc injuries will cause secondary cord injury during closed reduction. Additionally, the low interrater agreement while reviewing these scans in this study indicates difficulties in relying on MRI reporting. In the context of DF injuries, the high incidence of these MRI-identified lesions coupled with the very low incidence of secondary cord injury during closed reduction, suggests that to act on every MRI-identified disc prolapse would result in a cumulative clinically unacceptable time delay before reduction. Thus delay due to insistence on pre-reduction MRI or based on a potential disc at risk on MRI is likely to cause a greater cumulative neurologic deficit to the cohort from failed recovery than the potential of secondary cord injury due to the rare postreduction disc compression. This forms the first part of a larger study that combines clinical data and decision-making to identify whether in fact the presence of these disc lesions altered our clinical approach. In this study our most reliable interrater variable to ascertain the presence of a hazardous disc lesion was posterior protrusion of the disc and the clinical impression as to whether the disc was contained or not. The use of Cohen's kappa value has been charged with being a conservative statistical tool6 but it has become the standard in the orthopaedic literature when comparing two parties' agreement. Interrater agreement of MRI disc injury variables in DF injuries in this study was never excellent. The best agreement was found in the assessment of posterior disc prolapse and the researchers' overall impression of containment. Radiologists tended to report a more severe disc injury than orthopaedic surgeons. For these reasons we advocate that the treating surgeon personally assess the MRI scan prior to clinical decisionmaking rather than relying on a report. Having identified a small subset of patients where there was in fact consensus that the injured disc was potentially hazardous in terms of closed reduction, the authors have initiated a follow-up study correlating MRI data with clinical management and outcome.